— Three weeks after they were opened for the first time in three years, space shuttle Endeavour's cargo bay doors were closed on Tuesday (Oct. 21) to await the next phase of the retired NASA winged orbiter's museum display. 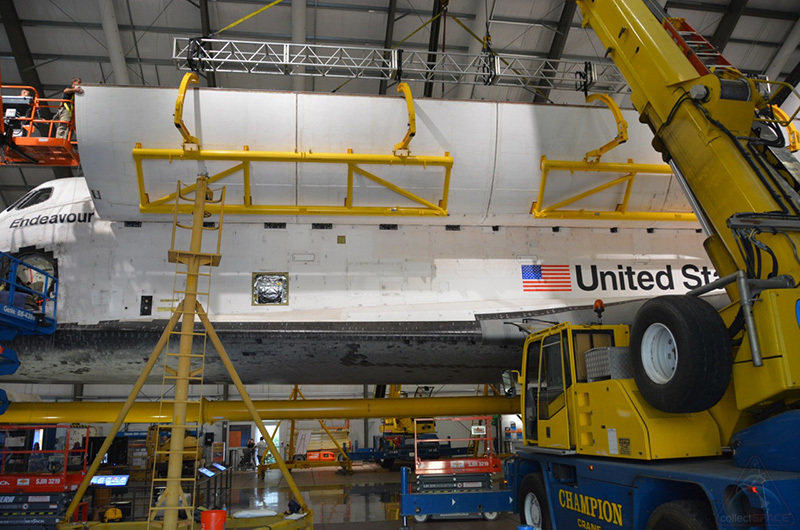 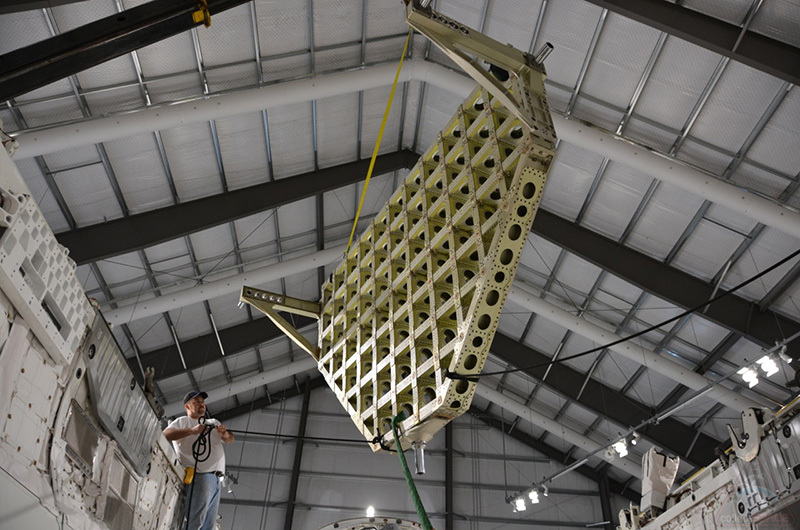 The California Science Center (CSC) in Los Angeles successfully closed out its "Go for Payload" activities by again sealing the shuttle's 60-foot-long (18-meter) bay doors that were designed to be opened and closed only in space. 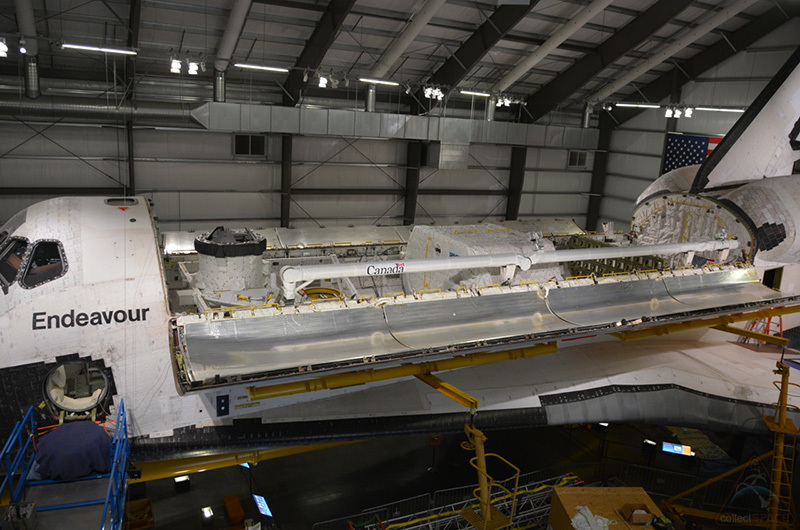 Until one of the doors is next opened in 2018, they will hide from view the reason they were briefly opened now — Endeavour's newly-added payload. 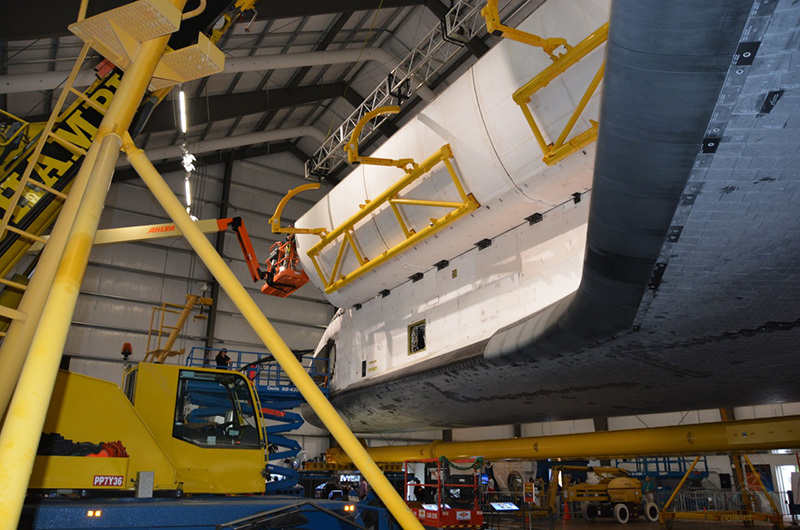 The CSC ultimately plans to exhibit Endeavour as it previously appeared on the launch pad, its nose pointed skyward and mounted to twin solid rocket boosters and an external fuel tank. 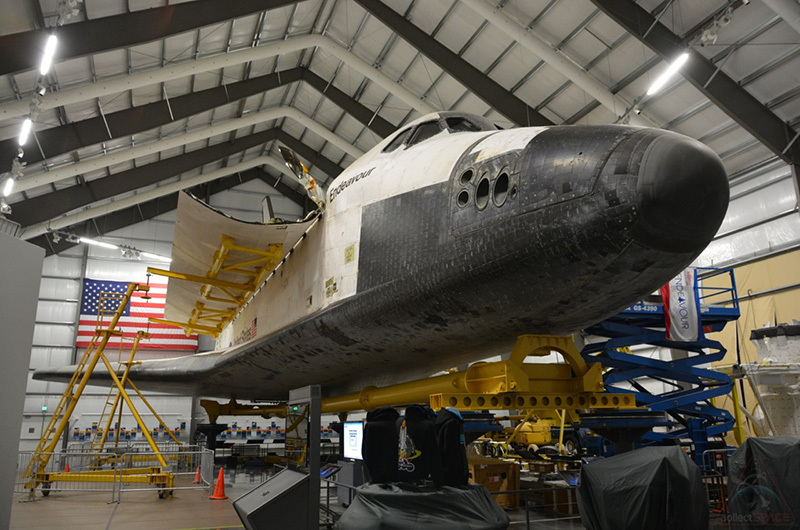 The towering, unprecedented display, to be housed in the science center's next-to-be-built Samuel Oschin Air & Space Center, will offer visitors the chance to explore the shuttle from its top to bottom. In its final vertical state, Endeavour will have one of its cargo bay doors open to allow guests to look inside. 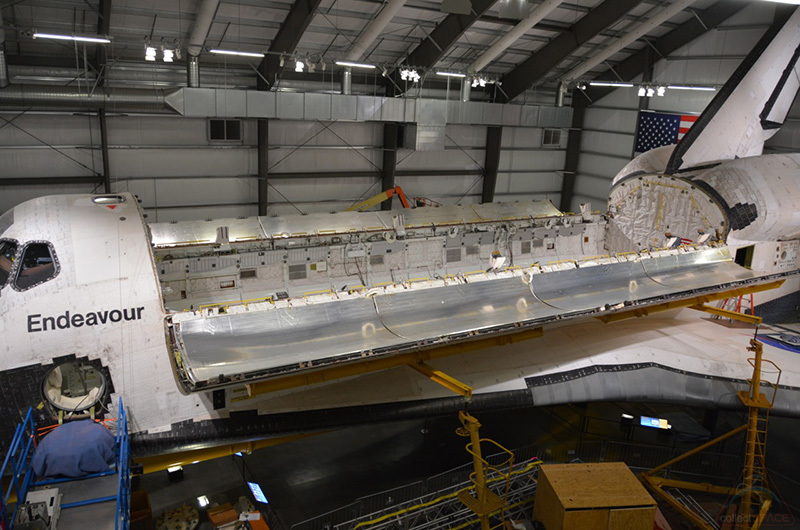 Rather than view an empty hold, the CSC took this opportunity to outfit the bay with a flown-in-space Spacehab logistics module and replica components modeled after how Endeavour appeared in Earth orbit on its 20th mission, STS-118, in 2007. 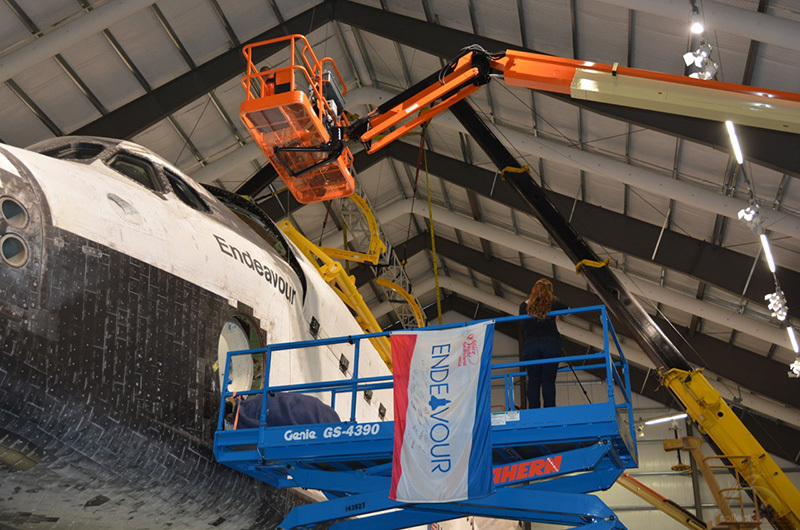 The photos presented here, shared by the CSC's project director for Endeavour's future display, capture the orbiter's final payload operations from door opening to doors shut. 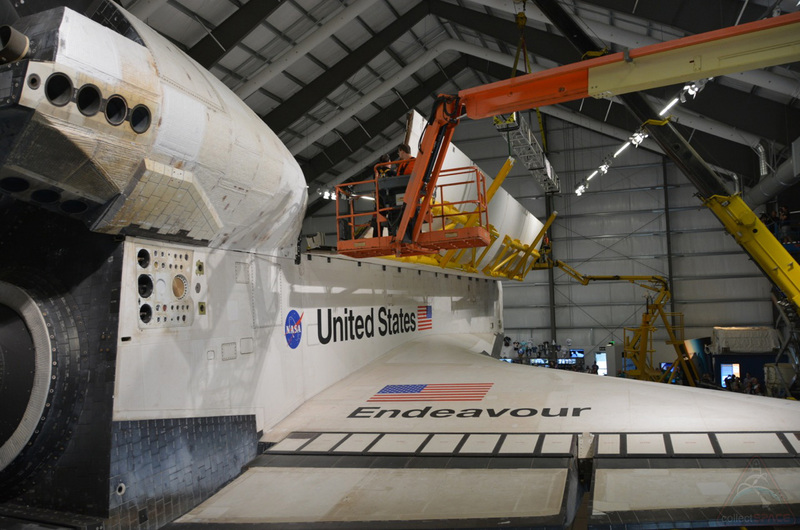 Endeavour's payload bay opening marked the first time the doors had been opened outside of Kennedy Space Center in Florida or the assembly and maintenance hangar in Palmdale, California. 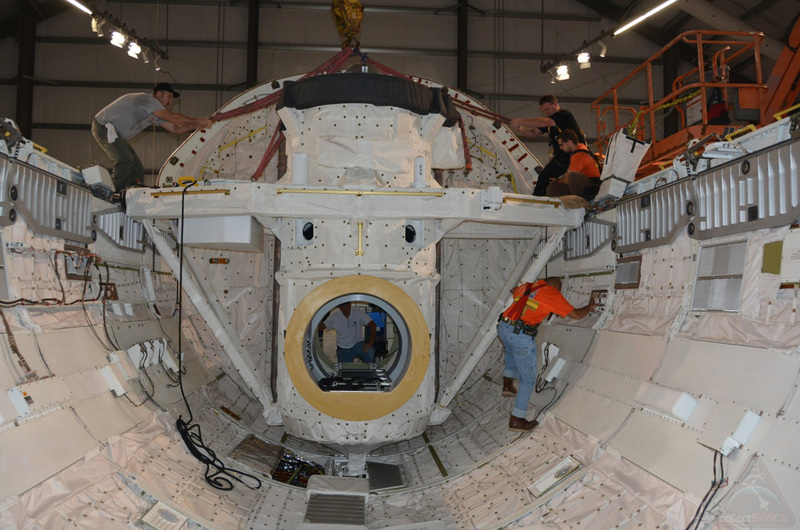 First to be installed in Endeavour's payload bay was a replica of its external airlock and docking adapter. 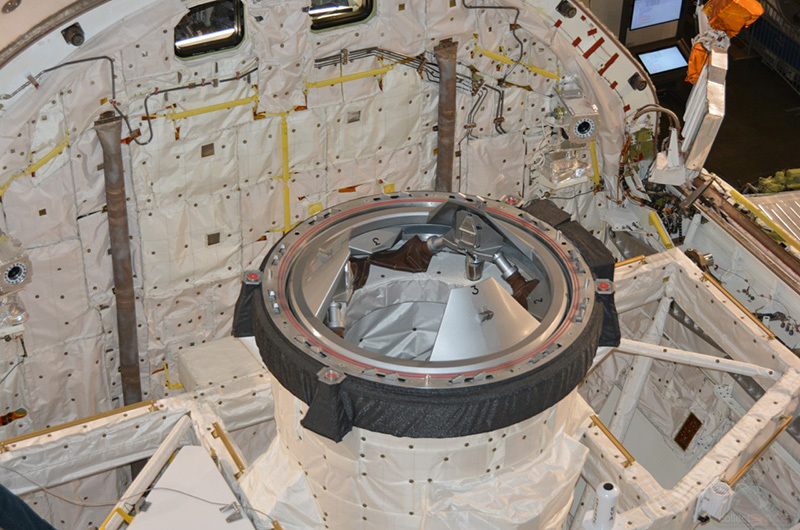 Here the airlock can be seen through the crew hatch looking out from inside Endeavour's middeck. 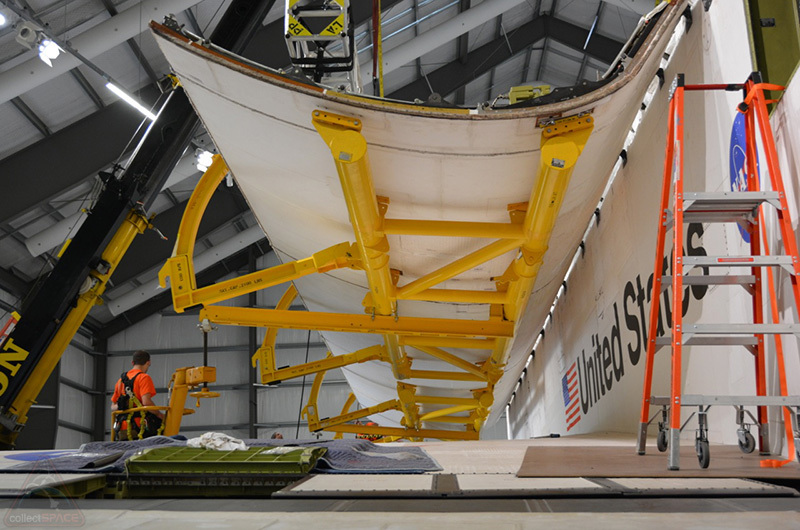 Next to be added was an authentic integrated cargo carrier. 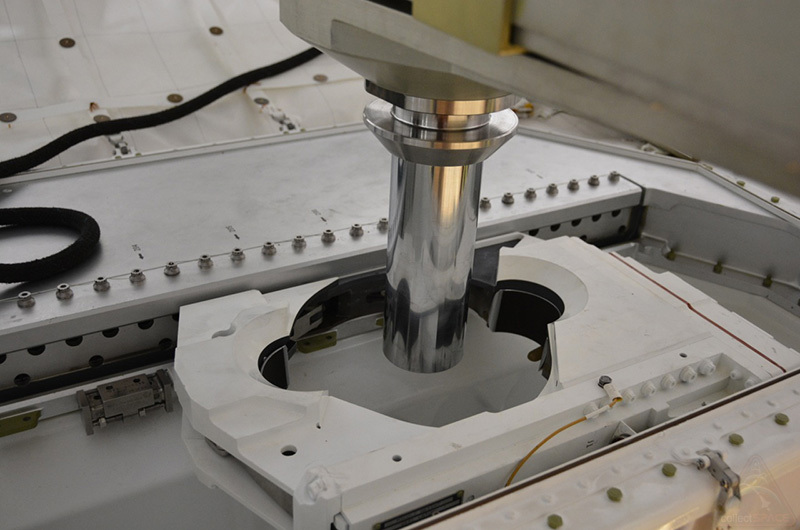 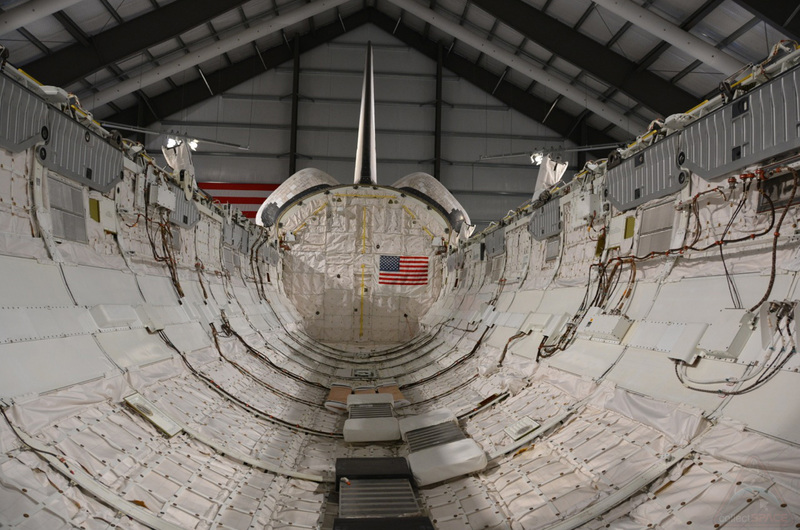 Some of the attach points used to mount the payloads in Endeavour's bay were provided by the Smithsonian's National Air and Space Museum from inside space shuttle Discovery's bay. 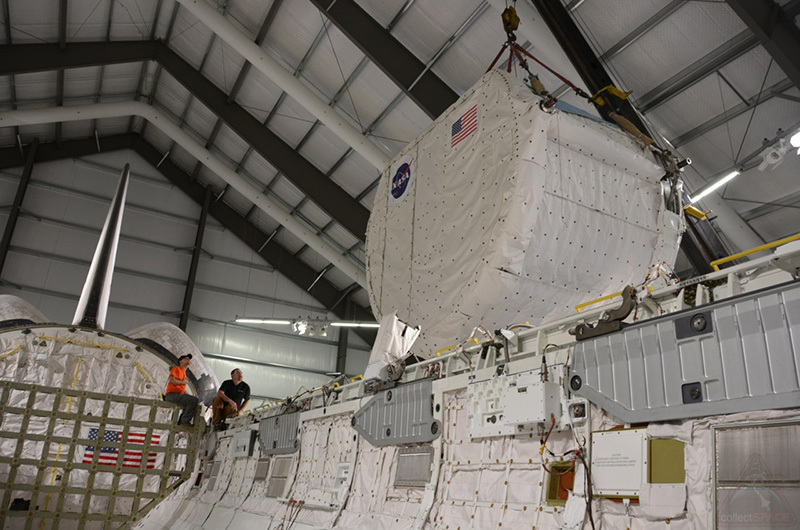 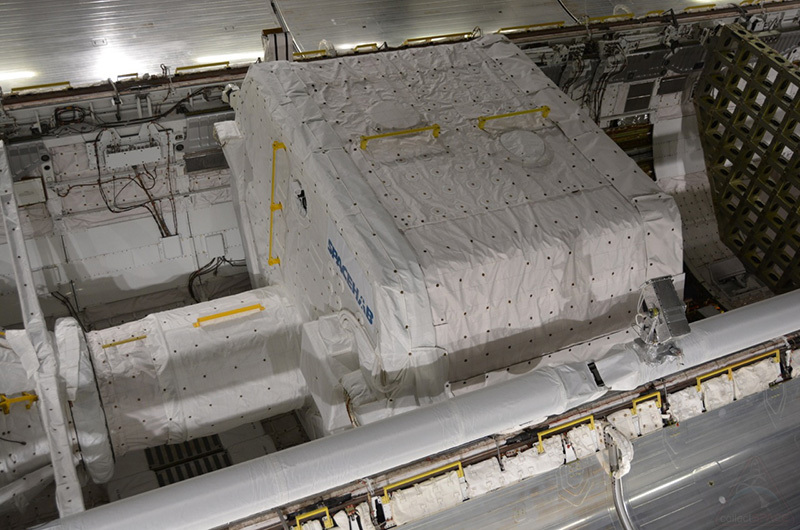 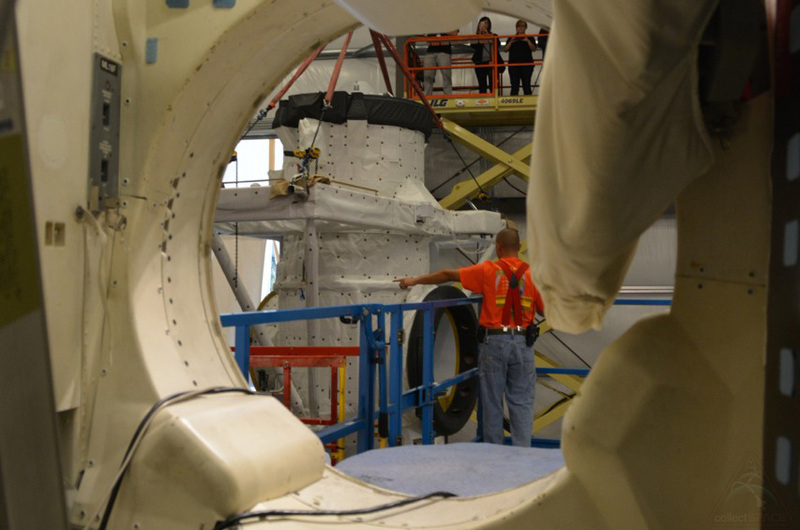 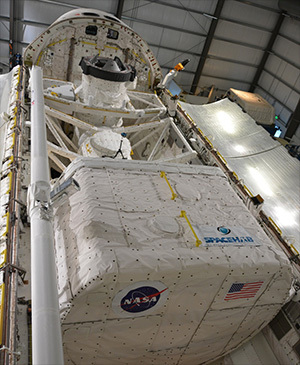 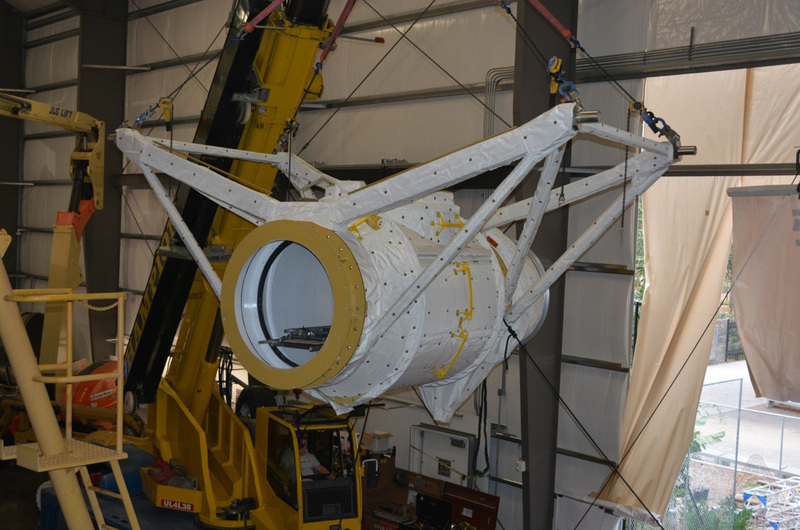 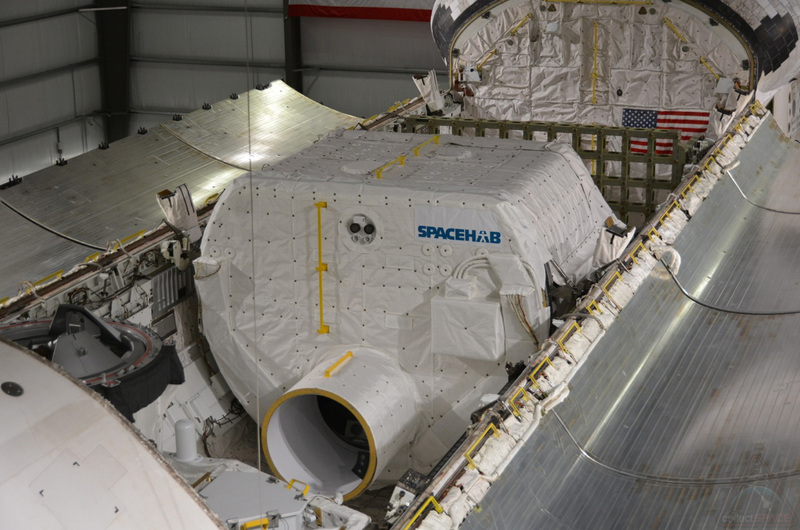 On Oct. 9, the Spacehab logistics module was installed. 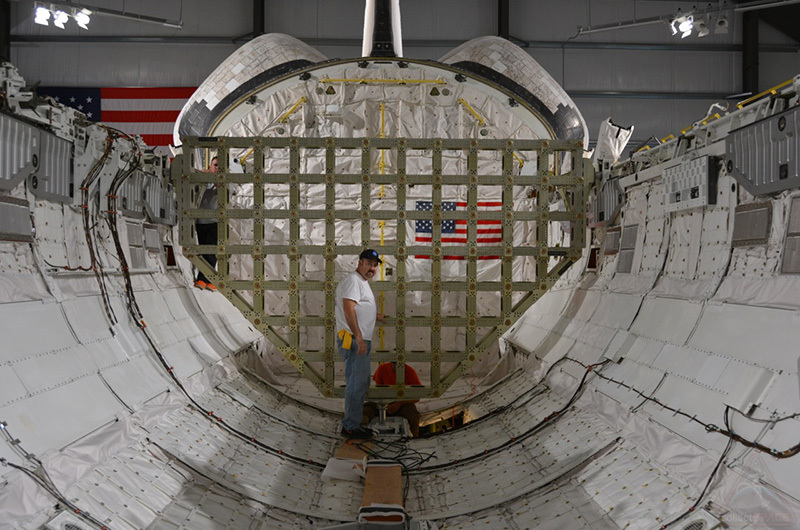 Used to carry science experiments and space station supplies, this unit flew on eight missions (STS-79, STS-81, STS-84, STS-86, STS-89, STS-96, STS-101 and STS-106) as part of a double module. 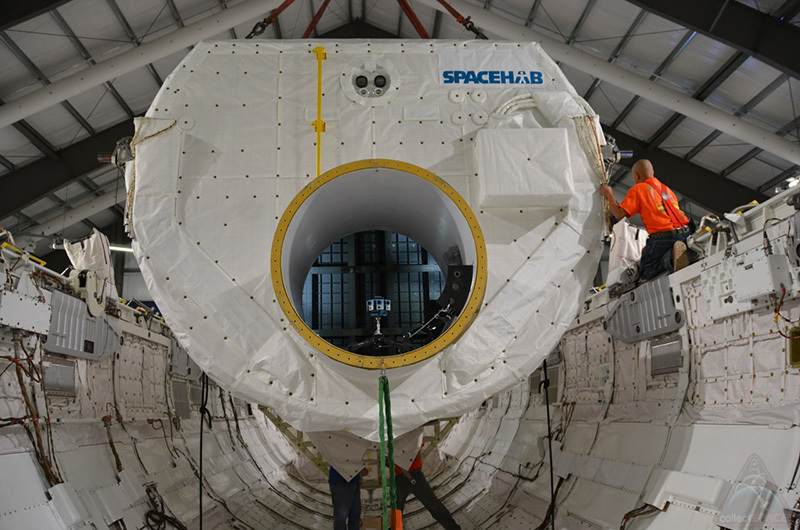 A replica tunnel adapter was added, connecting the Spacehab to the airlock. 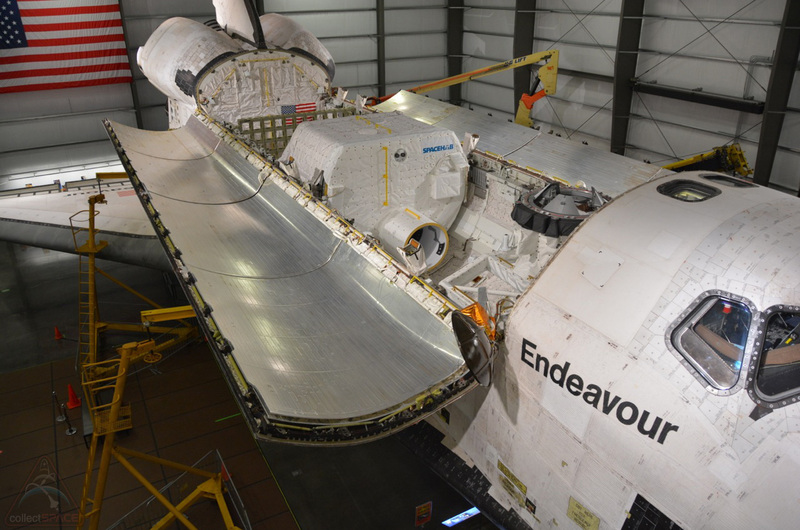 In space, the tunnel allowed crew members to move between Endeavour's cabin and the module in the payload bay. 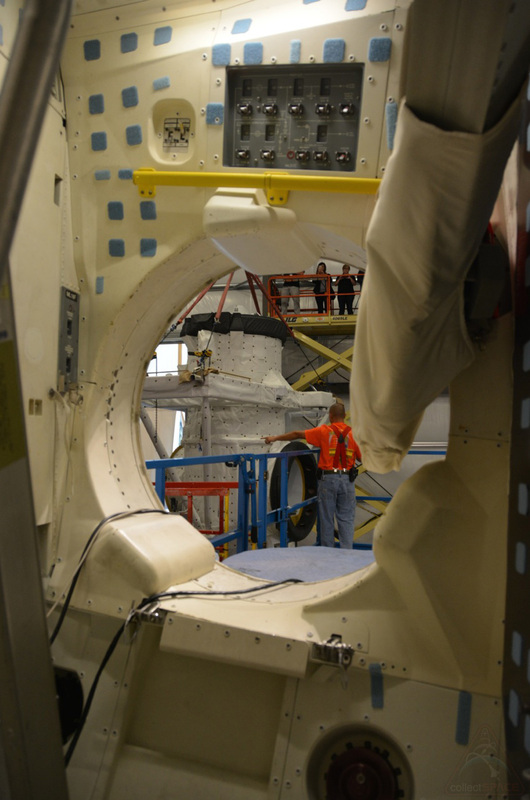 Also installed, a replica of the Canadarm robotic or remote manipulating system. 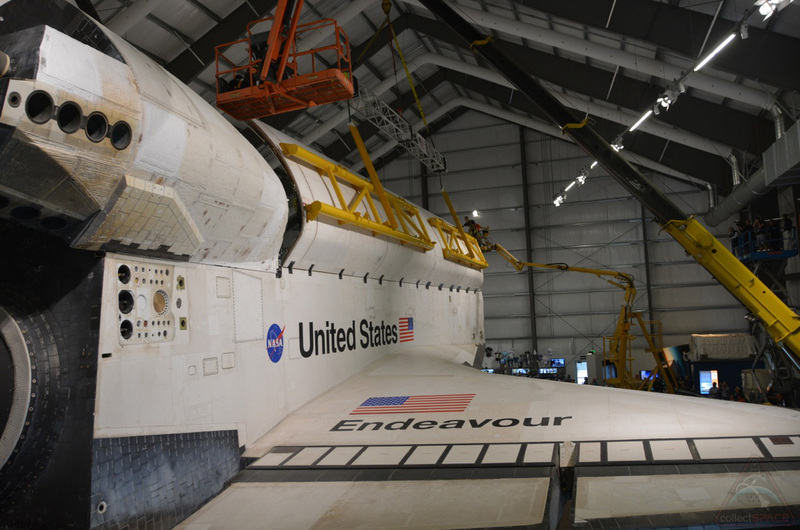 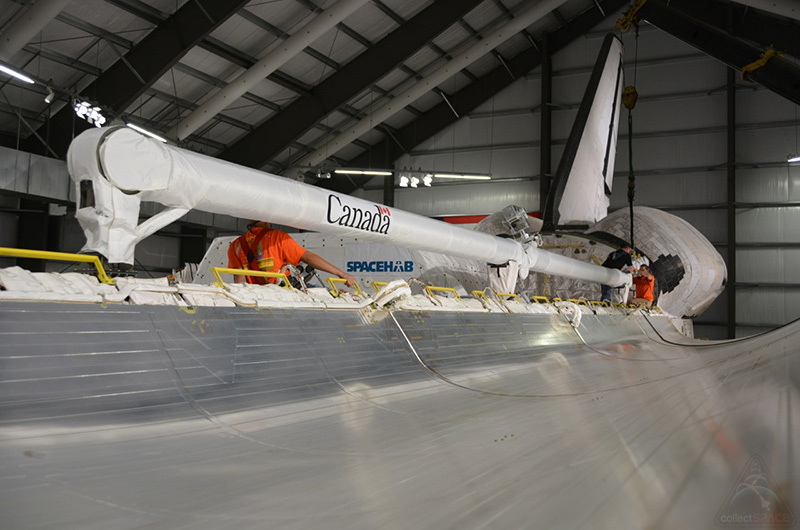 Endeavour's flown arm is on display in Canada. 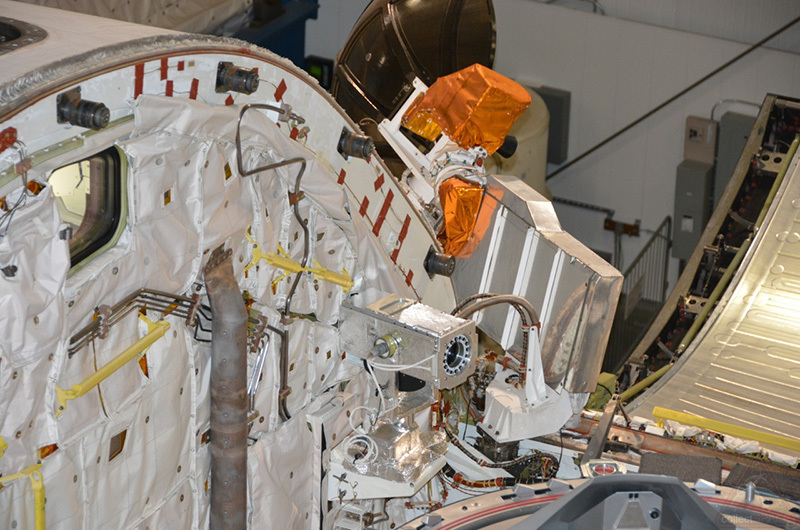 Four replica payload bay cameras (A, B, C, and D) were added to each of the corners of the bay. 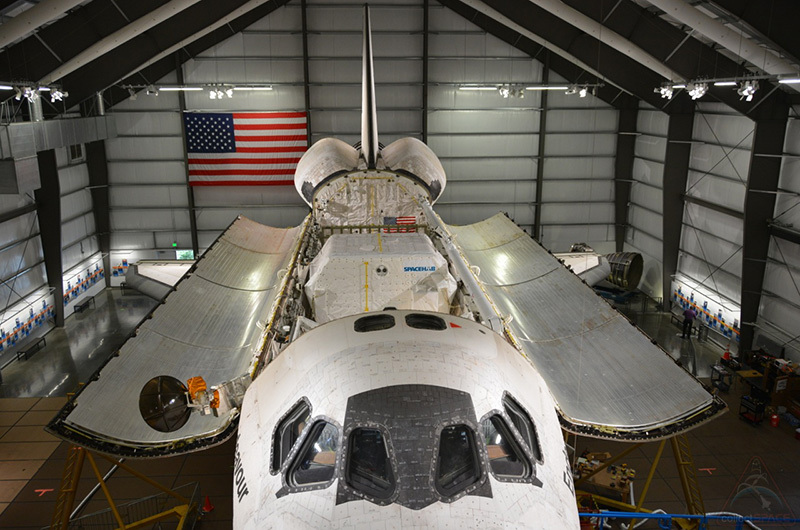 Also installed, more than 7,000 feet of wiring, allowing the California Science Center to light the interior of the payload bay, flight deck, and middeck.